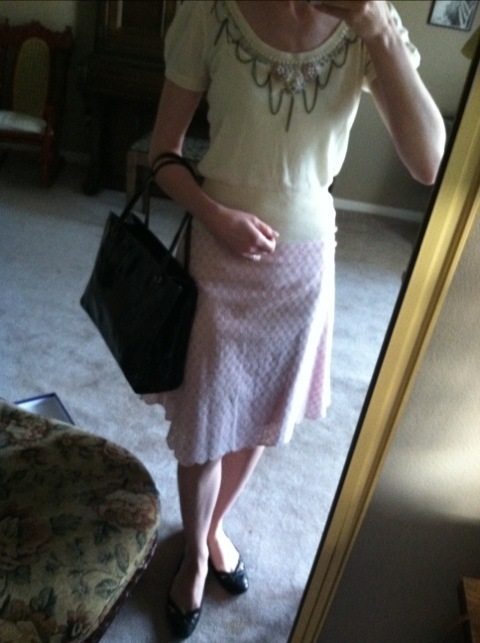 This is one of my favorite summer skirts! I usually pair it with a white t-shirt and wear it to death ALL summer. Thought I would style it different today. Yesterday I started my shoe project! I bought paint from Home Depot, we shall see if it sticks to that leather before I start glueing on crystals. If it flakes, I’ll have to pick up some luminere paint from the craft store sometime this week. I’ll post pictures at some point of my progress! This entry was posted on May 7, 2012 by katespadegirl. It was filed under Outfit of the Day and was tagged with eBay, Forever 21, hand painted shoes, Jimmy Choo, Kate Spade, Odille.